White Cliffs, better known as Mike’s Brewery, was and (spoiler alert) still is my original pick for oldest brewer. Founded in 1989, it narrowly boxes out Sunshine Brewery for the title by two months. Many of us were surprised and perhaps a little dismayed to hear in June that White Cliffs would be going into liquidation, due to outstanding Customs and Excise debt. But this wasn’t to be the end of Mike’s Beer. Owner and operator, Ron Trigg announced that he would be starting a new company (Mikes Holding’s Limited) and buying back White Cliff’s assets from liquidators, essentially starting Mike’s again, now unsaddled by historical debt. I’ll be honest – it’s a somewhat dubious bit of company law that allows this and it can, to put it bluntly, be used by the unscrupulous to bilk creditors. I’ve criticised another brewery for doing this sort of manoeuvre in the past; which makes it a difficult move for me to support. But on the other hand, that not necessarily what’s happening with Mike’s. In fact it was revealed by Ron in an article in The Pursuit of Hoppiness Magazine, that Mike’s Holding’s Limited has taken on approximately $100,000 of debt from White Cliffs (Summer 2016, p. 47 link to the issue here). So it seems that Mike’s is trying to do the right thing by their creditors. On balance, I’m happy that Mike’s lives on. The Triggs are friends and good people, and I don’t want Mike’s to disappear. But what does that mean for their status as ‘Oldest Brewery’? If a brewery goes out of business, then starts up again with the same name, from the same location making the same product, is it fair to call it the same brewery? To make a call on the matter, I had to go back to my original criteria for judging oldest brewery – continuity of supply. Could I, as a punter, reasonably expect to go buy a beer, and it to be the same product? So Mike’s can, in my opinion, hold onto it’s Oldest Brewery title for now. But there’s another brewery that quite a few people have brought up, which I really should have addressed in my previous post. The Shakespeare Hotel was founded in 1898, and is often touted as having the oldest licence to sell alcohol. The Shakespeare Hotel’s brewery was commissioned in 1986, three years before Mike’s, making it at the time, the first modern brewpub in the country. The original brewer was one Barry Newman. When I was writing the original post, I admit I dismissed The Shakespeare out of hand. Eventually [Shakespeare] beer did flow again, the Dogberry Pale Ale coming out just before Christmas 2011. (Donaldson, 2012, p. 127). Obviously, a brewery closing down for a period of time will break the all-important criteria of continuous supply (this is one of the reasons I disqualified McCashin’s earlier). So I crossed The Shakespeare off the list. Sometime after I published the previous post, I spoke to Ben about The Shakespeare Hotel and learned, to my surprise, brewing was shut down there as late as 2009. This means that far from being a long leave of absence, it was a period of roughly two years that no beer was produced, not the five or six years I had assumed earlier. 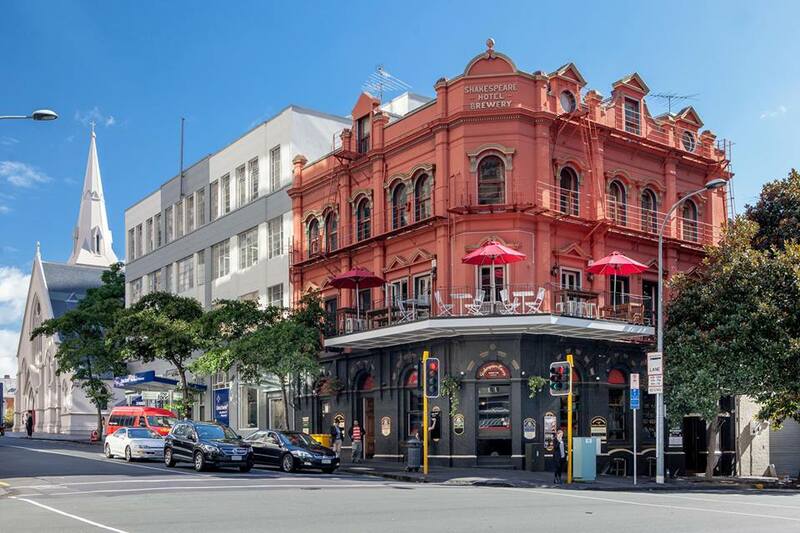 When we refurbished and resurrected the brewery, Frances McCullough, the actual owner of the Shakespeare building and various other pubs around Auckland, was still pouring some of the beer left in the tanks from when Barry Newman [The Shakespeare’s previous brewer] was still working there. I made them take it off as it was in a very bad state. On the one hand, this revelation kind of puts a new spin on things. The rule of continuous supply may well have been nominally satisfied over almost all the two-year period the brewery was shut down. On the other hand, I also feel that to say The Shakespeare was still a functioning brewery, just because they hadn’t run out of beer yet, is kind of following the letter of the law, rather than the spirit, particularly if the beer should have gone down the drain a long time ago. With this in mind, I can’t in good conscience, say that Shakespeare is a better candidate for the longest continuously operating brewery over Mike’s, who have delivered essentially the same products, fresh to customers uninterrupted, over the same time period. Almost a year after I published the original post, I was contacted via the comment section by one Warwick ‘Jamie’ Jameson, claiming that the true oldest, still operating ‘craft’ brewery is actually Anchor Brewing, also known as The Village Brewery, established 1984. I honestly didn’t know what to make of this claim. I’d heard of Anchor Brewing – it’s still listed on Beer Tourist, and Martin Craig of Beertown had recently unearthed an article he wrote in 1993 about the brewery. But as far as I was aware, Anchor closed some time in the 90s. In fact I had it listed in The Craft Beer Graveyard. Was this true? I started digging. From what I can tell, Anchor was indeed opened in Porirua in the mid eighties. Jameson says 1984, all other sources, including Richard Brimer’s Microbreweries of New Zealand (1995), and the Companies Office record it as opening in 1985, but let’s not split hairs. 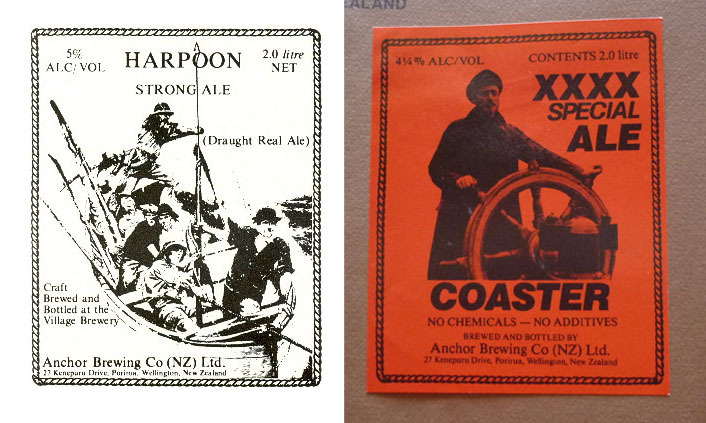 Some rather fabulous Anchor Beer labels I found in the depths of Google. Note the VERY early use of the term ‘Craft’. Anchor focused on making ‘Real Ale’ styles, and Jameson made some fairly bold claims about his beer. Not only did he state that “our beer is consistently the best in the world in terms of hop aroma and flavour”, he also claimed that it gave drinkers immunity to the common cold (Brimer, 1995, p.44). Unfortunately I can’t confirm either assertion. But what about Anchor being the oldest still operating brewery? While Anchor still exists in the Companies register, Jameson says he sold the brewery in 1996 to “fund my ongoing scientific research into the true medicinal properties of beer”. Specifically how ‘hop related components’ may relate to a cure for AIDs. Whilst I must refrain from speculating on the matter, wouldn’t that be something? Jameson states that he is currently writing a paper on the subject for peer-review. I look forward to reading it. I can find no evidence of any beer being produced or sold by Anchor or the Village Brewery after 1996. With no beer being produced for twenty years, Anchor Brewing must unfortunately, stay in the Craft Beer Graveyard. Michael Donaldson, Beer Nation: The Art & Heart of Kiwi Beer, 2012, Penguin Group. Richard Brimer, Anne Russell, Microbreweries of New Zealand, 1995, Random House. A full bibliography can also be found at the end my previous article on this subject, here.